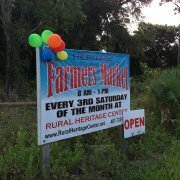 Rural Heritage Farmers Market is held at the Rural Heritage Center from 8AM to 1 PM. Always the 3rd Saturday of each month. We are now outside , buy local, support local…. Honey, fresh bread, hydroponics, veggies, jams, jellys and so much more, buy local ,support local.Want to learn more about the history of our Village? The Little Free Library is also there for you to get a book(s), leave a book(s). We will have a “Heritage Corner” focusing on learning a “trade” or “skill”. Want to learn about growing a garden? How about beekeeping? Soap making? Your family can learn skills together. Would you like to be in our Farmers Market? Do you grow or make something? If so, please call for availability for the October Geneva Farmers Market from 8am to 1pm always the 3rd Saturday of each month at The Rural Heritage Center 101 E Main St Geneva, Fl. We have 10X10 spots left to rent and, if interested, contact Trish Deer: 407-733-7514. thelogcabinmama@gmail.com.